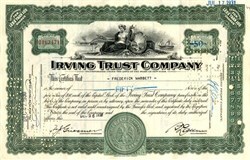 Beautifully engraved certificate from the Irving Trust Company issued in prior to 1935. 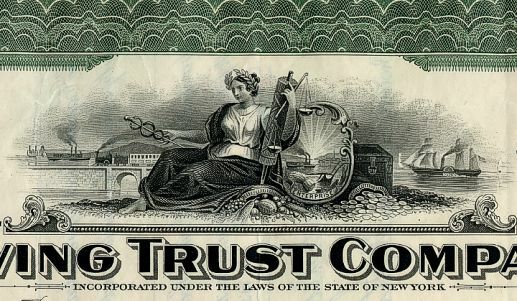 This historic document was printed by American Banknote Company and has an ornate border around it with a vignette of an allegorical woman sitting in front of a ship and a steam locomotive. This item has the printed signatures of the Company's Vice-President and Vice-Secretary and is over 81 years old. December 4, 2006: The Bank of New York and Mellon Financial Corporation announced a merger, in which the name would be changed to The Bank of New York Mellon Corporation, or BNY Mellon, creating the world's largest securities servicing provider and a top asset management firm globally.